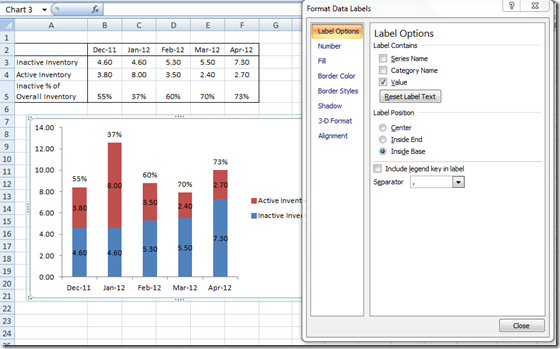 There are times when you are creating your Excel Dashboard Design that you desire something that does not come naturally with the Excel Tools as designed. 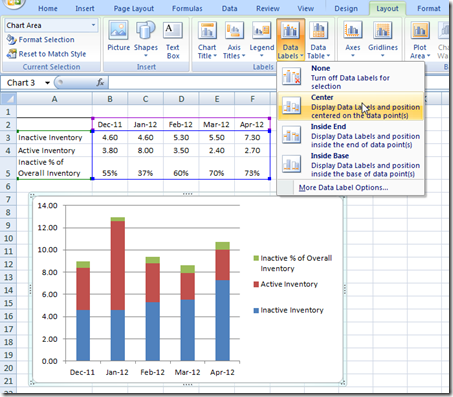 In those times you will need to come up with a solution using Excel Tips and Tricks. Here is a simple one that works for the following scenario. 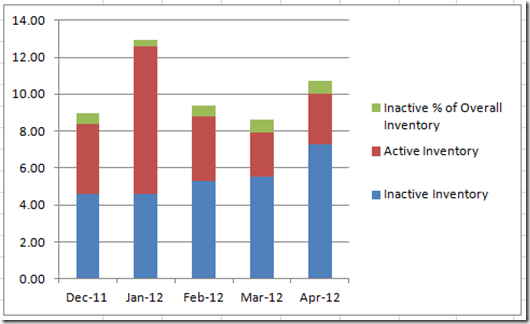 1) Highlight your Data and Categories from A2:F5 and create a 2-D Stacked Column Chart in Excel. 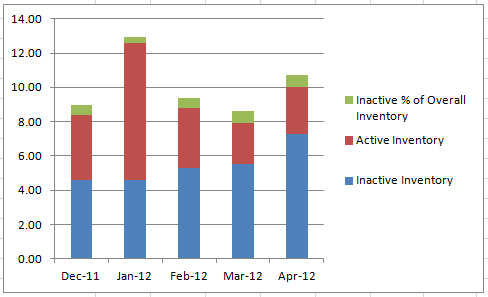 2) Add Labels to the Chart. 3) Here is the Excel Trick: Hide the inventory percentage stacked column by changing the fill to No Fill. 2) Next we need to Add Data Labels. 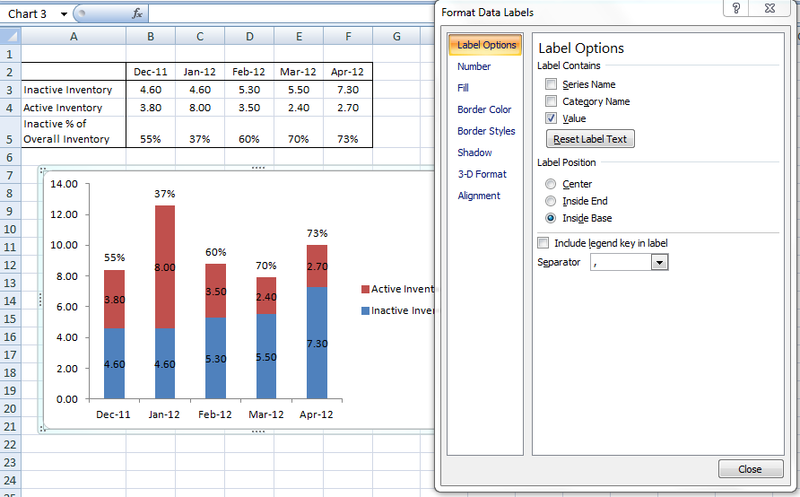 First select your chart in the white area and then go to your Layout ribbon and choose Data Labels and then Center. 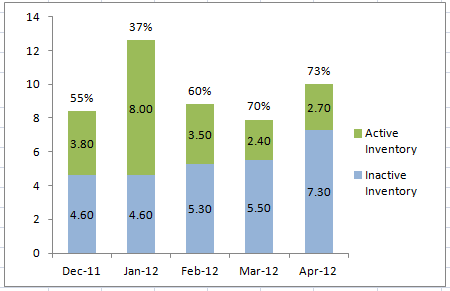 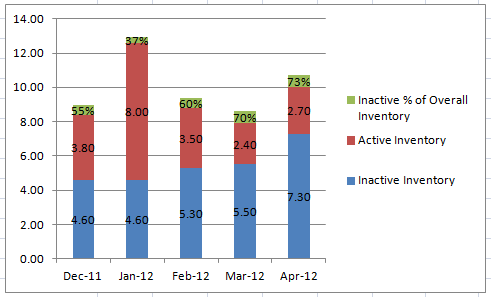 3) Now we need to select the “Inactive % of Overall Inventory” data series in the Excel Chart. 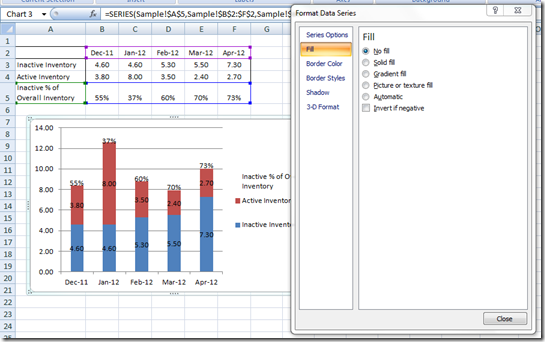 Since the percentages cover up most of the data series columns, it might be best to select the data series with an alternate approach to clicking on the data series with your mouse. 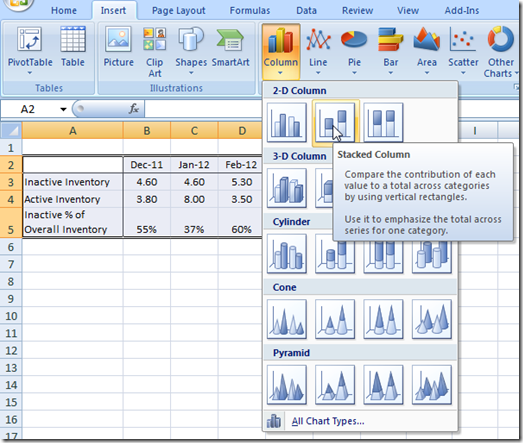 You can read more about this technique in this post: How-to Select Data Series in an Excel Chart when they are Un-selectable? 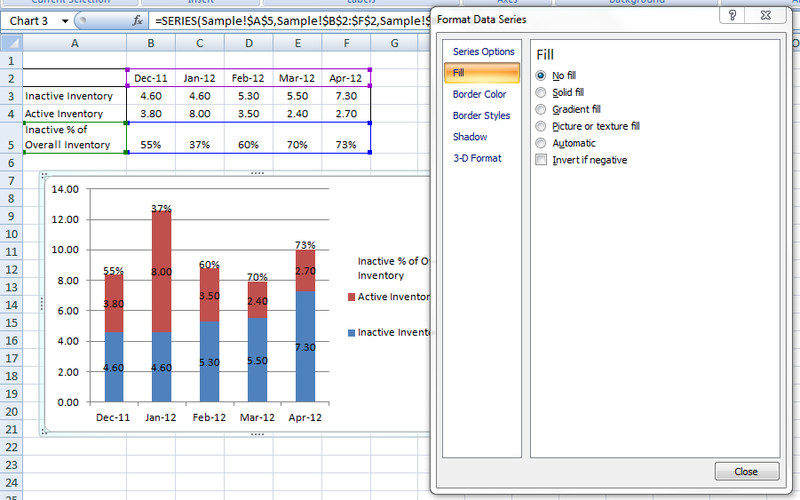 Then we need to change the fill color to No Fill. 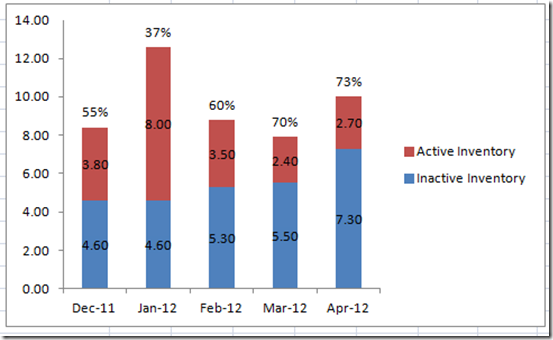 The Excel Graph is looking good. Based on where you data labels end up, you may want to adjust the data label position of the percentage series to inside base. 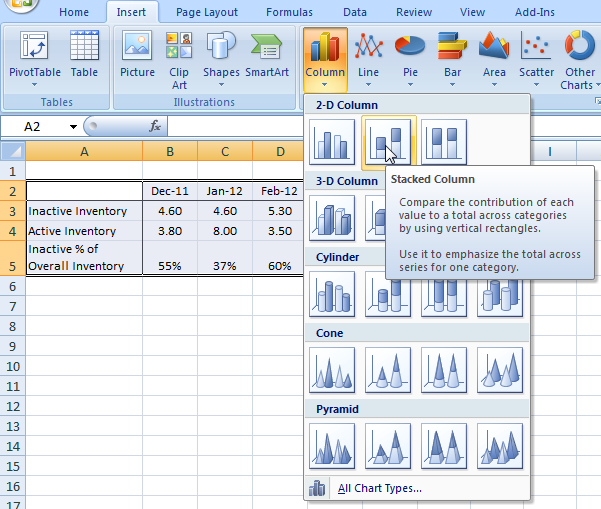 Add this Excel chart tip and trick to your bag of tricks and your next Excel Dashboard will be the talk of the town. 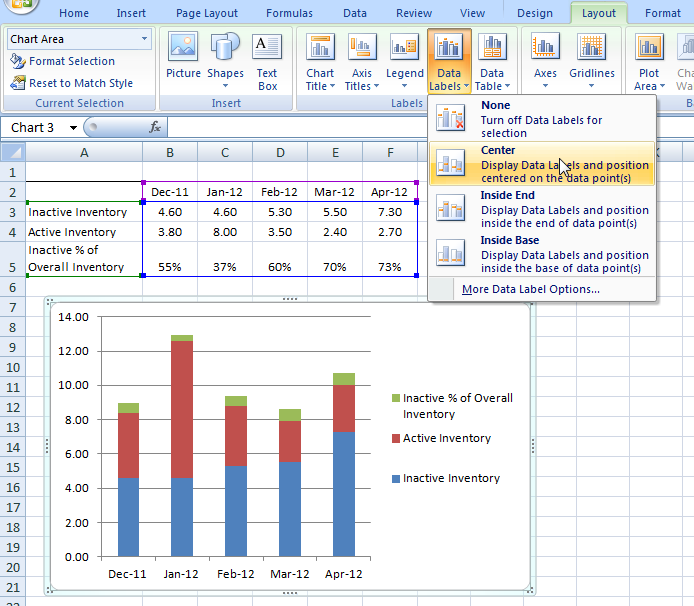 Hopefully this quick Excel Tip and Trick will help you in your Excel Dashboard Design. If so, please don’t forget to subscribe to my blog or RSS feed so that you can get the next post delivered right to your inbox.